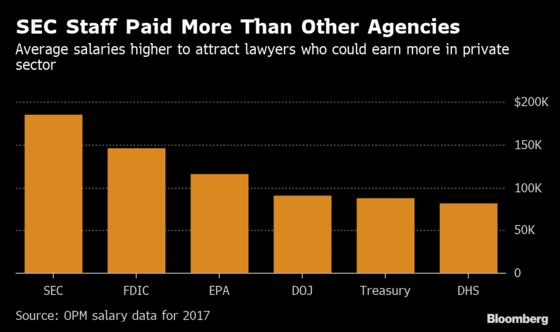 (Bloomberg) -- U.S. Securities and Exchange Commission employees are going to get more help and smaller raises under a plan laid out by Chairman Jay Clayton, and the agency’s union leaders aren’t happy about it. The Wall Street regulator will add 100 people this year after lifting a hiring freeze, Clayton said in an email to staff this week. In the same message, he said current employees would be getting pay increases averaging 2.4 percent, acknowledging that the boost might disappoint some workers because it’s less of a jump than they’ve gotten in recent years. “We worked actively to find a level that we believe to be meaningful and responsible at the same time,” Clayton wrote. In response, union officials made their disappointment clear, suggesting in an email to workers that the plan is aimed at bringing the pay of relatively well-compensated SEC personnel more in line with their contemporaries at other government agencies. “The SEC’s new message to its employees appears to be that you make more money than we think you are worth,” said Greg Gilman, a senior enforcement attorney at the SEC who also serves as the union’s president. The union said in the email that it plans to appeal Clayton’s decision. Gilman declined to comment beyond the message to employees. Natalie Strom, a spokeswoman for Clayton, didn’t immediately respond to a request for comment.